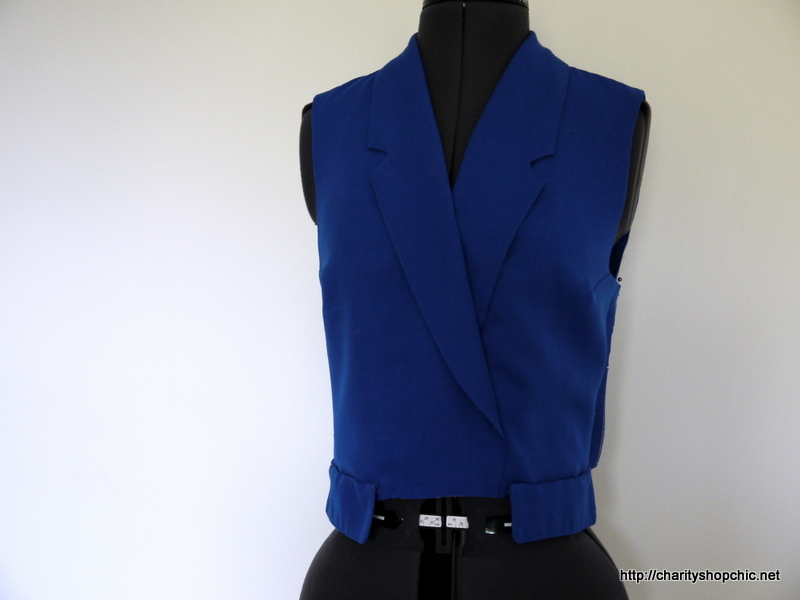 I started by removing the sleeves and I also cut off the button and the pocket flaps, playing with the overlap to see how much it could be overlapped without significantly affecting the collar roll line. 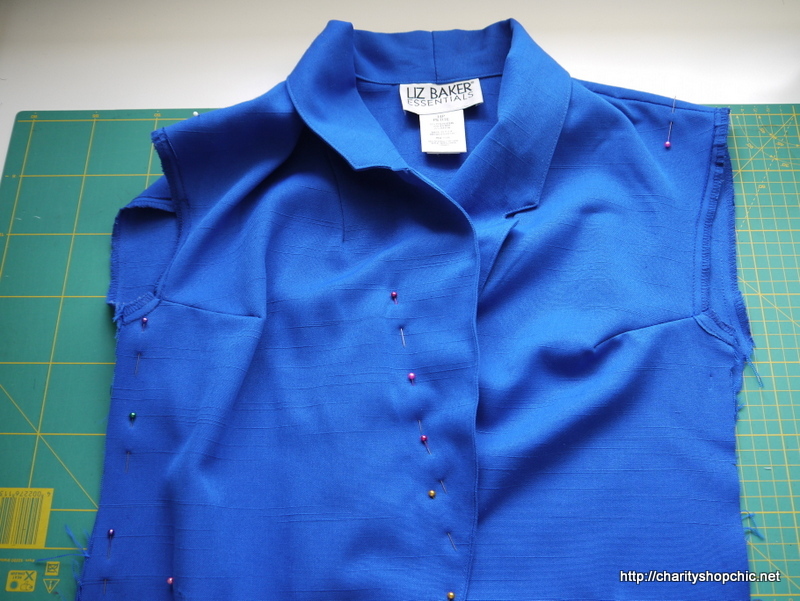 I didn’t get a photo of it, but there are two darts under the collar that meet the shoulder, so I didn’t want to expose those by moving the lapels too much. 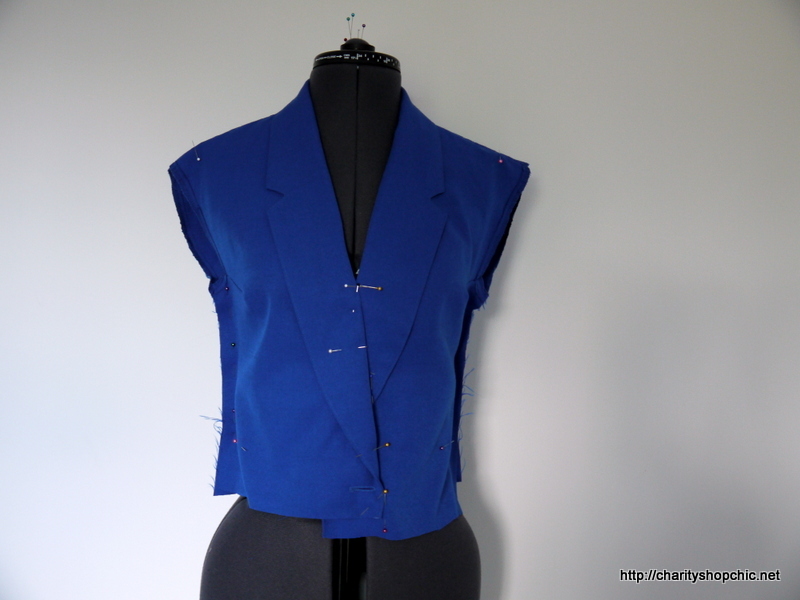 I tried it on in front of the mirror and marked the amount of overlap with pins, as well as new dart positions on the front and back, and how much to take it in on both sides. The collar/lapels were unchanged. 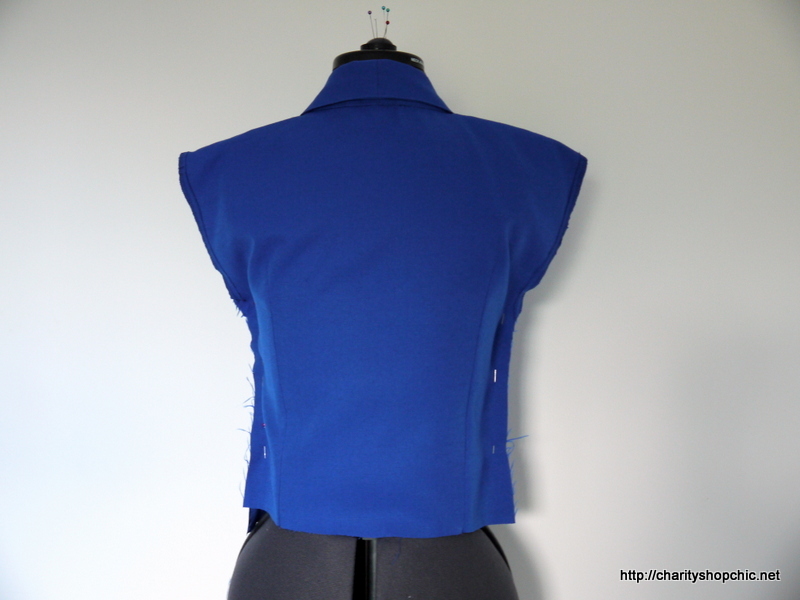 After sewing the darts, I cut it off below the waist and reassessed the overlap, the side seams and the shoulder points. 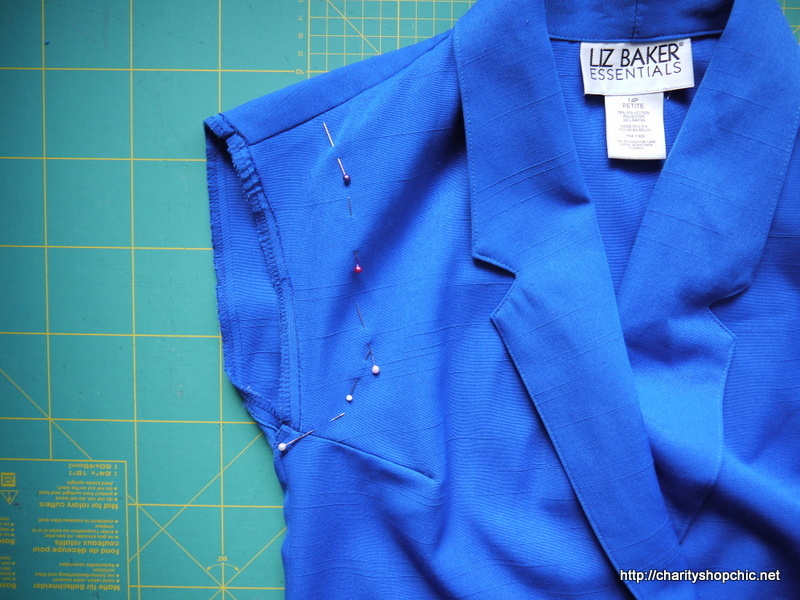 I joined the left front and right front together with a line of stitching under the lapel (line of pins at centre front below). You can’t really tell that the fronts are sewn together. 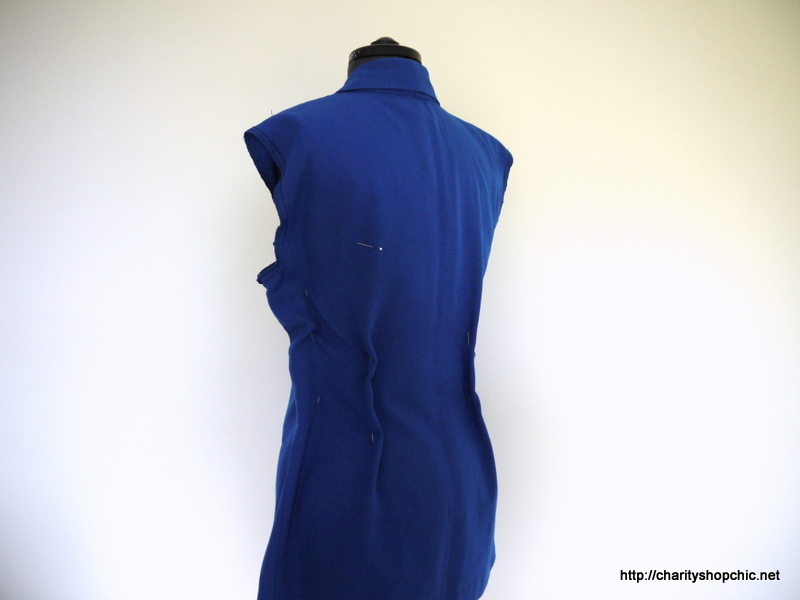 I tried it on again to mark the armhole shapes. 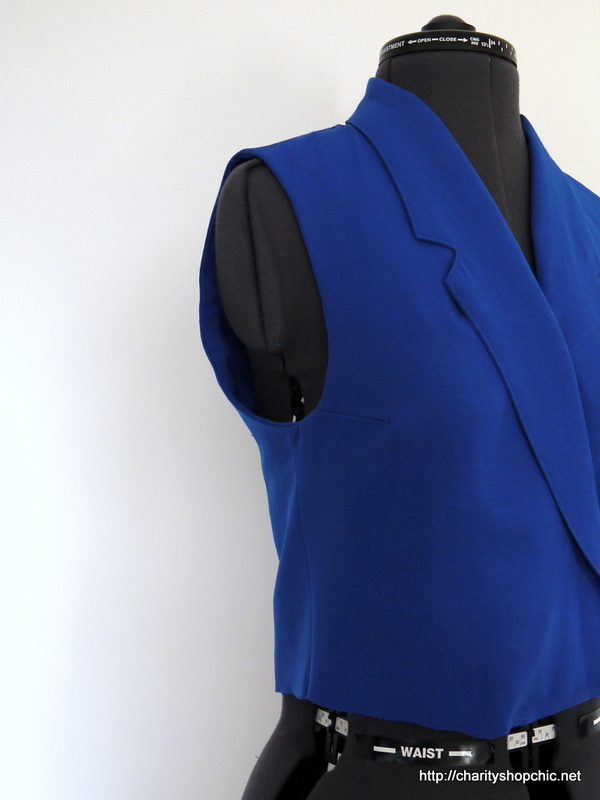 I was going to bind the edges but decided in the end to cut a pair of facings for the armholes. I had to cut these from the sleeves as they ended up being quite big. 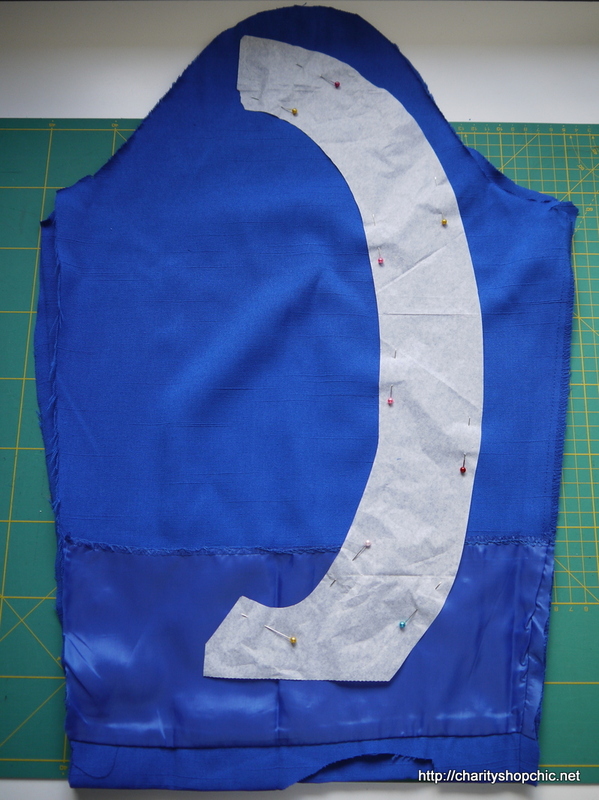 I applied fusible interfacing to the facings for stiffness. As an aside, you can also see below that there was actually a minimal amount of lining near the original cuff! The facings gave a nice clean edge to the armholes. I reattached the pocket flaps at the waistline and basted them on. 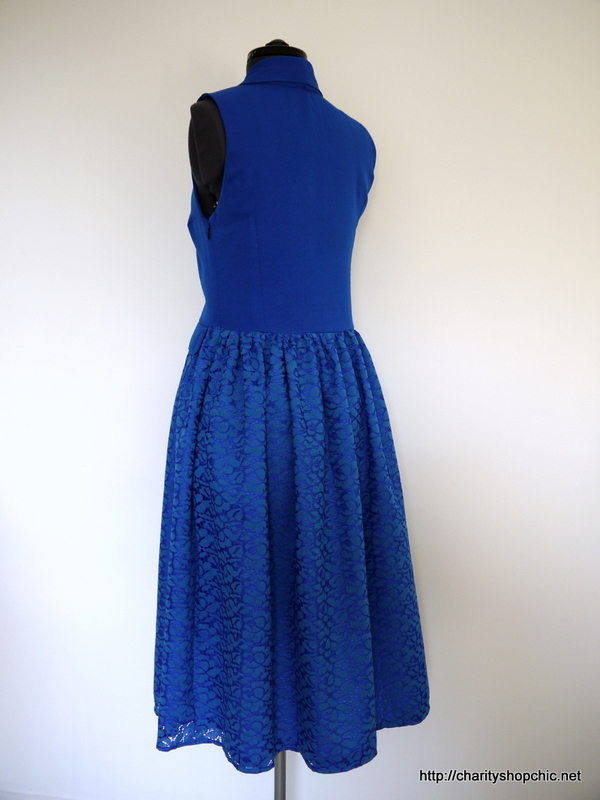 For the skirt, I scoured ebay to find some lace in a similar colour, and purchased a lining locally (a metre of each). I cut each in half down the fold line, joined them at the side and gathered both layers at the waist to make a simple dirndl style skirt. I toyed with the idea of trimming the lace around the individual flowers but settled for folding the selvedge up and topstitching. It looks OK. Note the side left open for the zip. And here it is on. With apologies for the indoor photographs. I wore this on a night out at Lima Floral with a couple of friends but sadly it was too dark for photos! Back length looks a little long here – I may have to reevaluate. For the record, I am wearing a petticoat for extra skirt volume. I decided on pink and gold accessories, just for fun. My bag looks like a pomeranian (it’s faux!!). Thanks, Raquel! I appreciate your comment. Bravo ! What a genius idea ! You’re beautiful ! Thanks, Kanika, and thanks for reading! I like the way you finish your work, it looks very professional. You certainly made a nice silk purse out of that sow’s ear. Thank you so much! Such a kind comment. I’m happy with the dress and I think it shows! You really do have the eye for taking the unloved and transforming it into something fab! This one is really pretty. 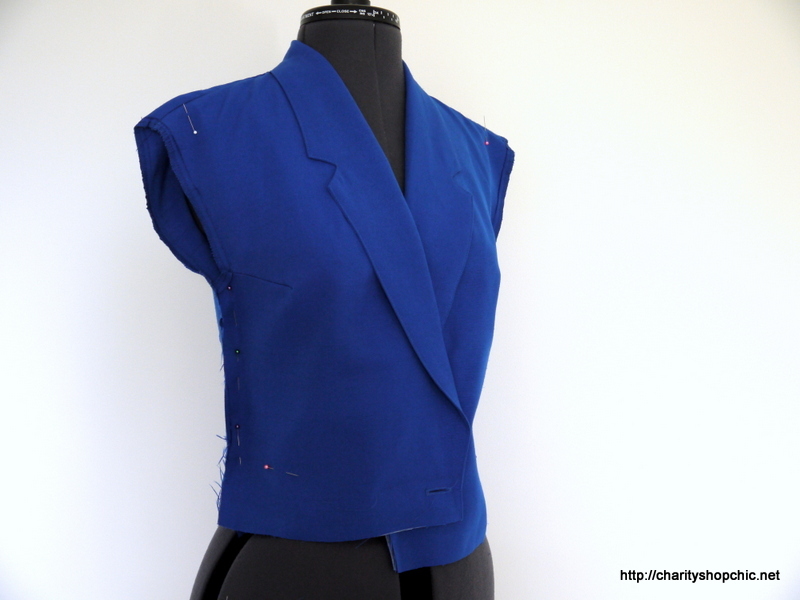 As a sewing novice with a hand me down sewing machine, I learn so much from this blog! I wish you had time to post every week! I wish I had more time too, Tara, I really do. I’d love to post more frequently but won’t compromise on quality! Thanks for your continued support. Beautiful transformation – I hadn’t noticed the lapels on the black outfit – a lovely detail to copy. 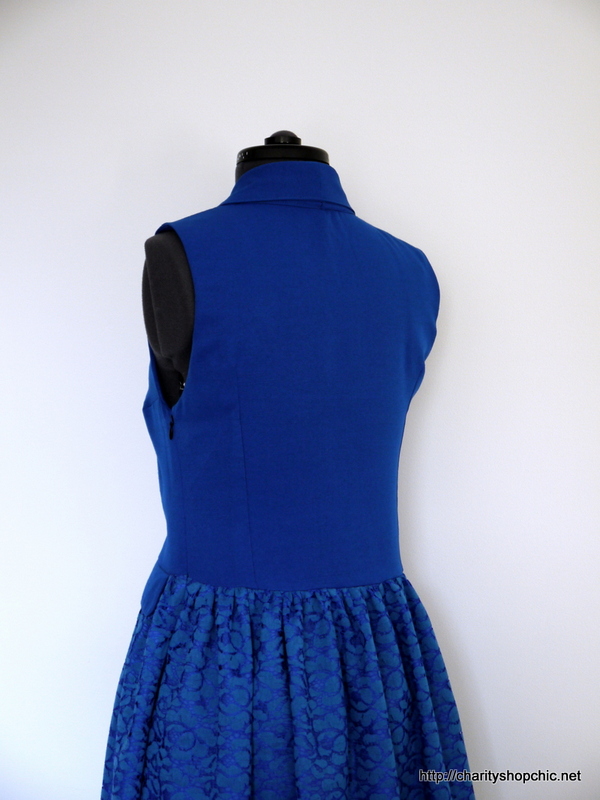 I have a large pile of clothes from charity shops that I’m slowly working my way through refashioned. Thanks, Chris! 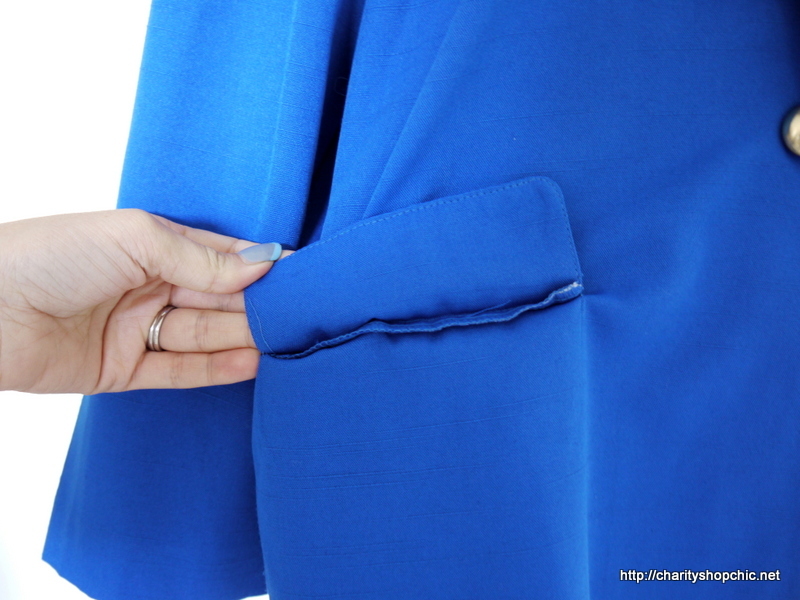 The lapels, and the pocket flaps, on the original were just too good to miss. You’re so clever! That colour is great on you too. 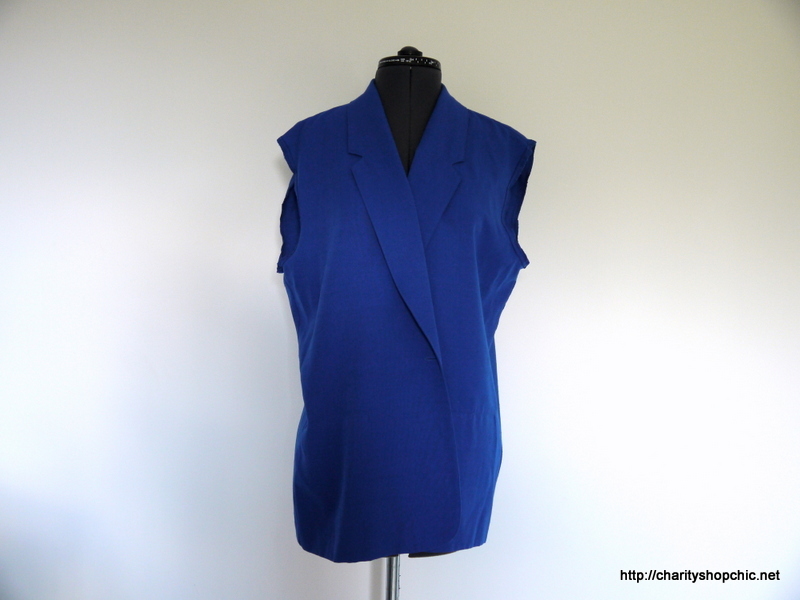 Amazing refashion! It looks amazing & your indoor photos are great – mine always look awful! Thanks, Charlotte! I hate indoor photos but sometimes there’s no way around it when there’s a backlog of things to be photographed. 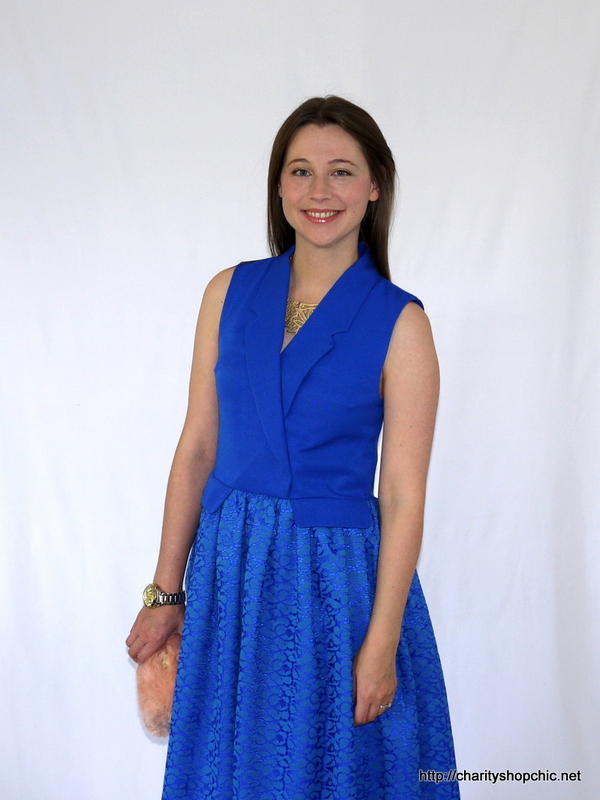 What a wonderful refashion — well done, you!! Wow! Like always, you are AMAZING!!! This is beautiful!! Thanks so much MJ for your continued support. I’m so happy you liked this one as much as I did. 04/10/2015 - 11:51 pm Linda of Nice dress! Thanks, I made it!! 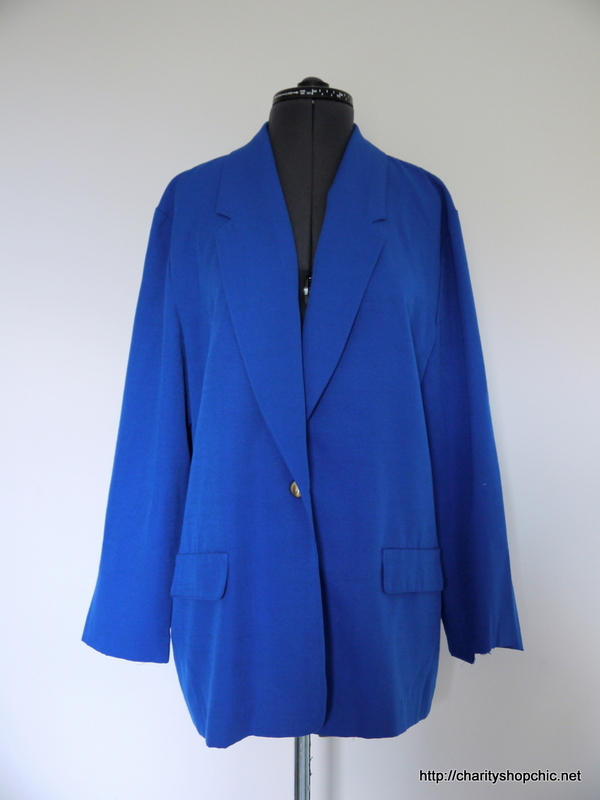 That is a fantastic blue … and a designer original! Haha, thanks for the idea, Dior! Thanks as always, for your support, Linda. Gorgeous! 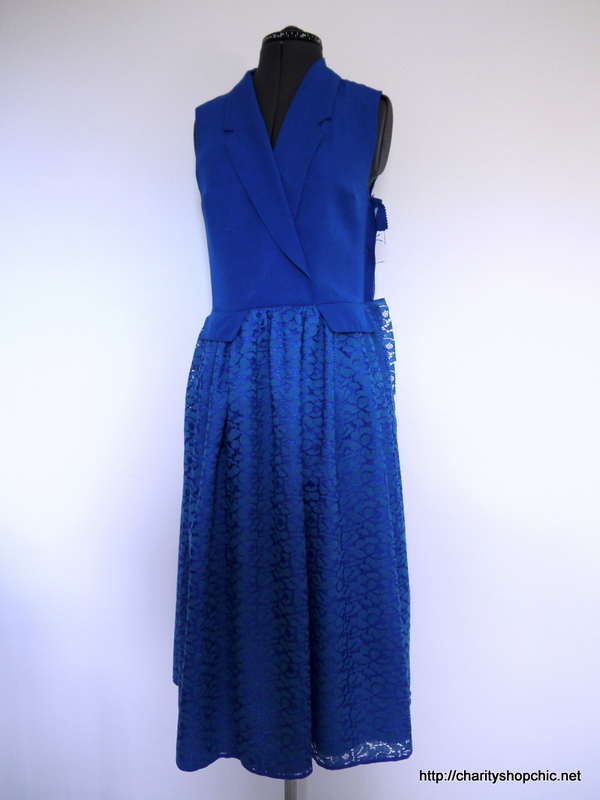 Better in blue than in black even! 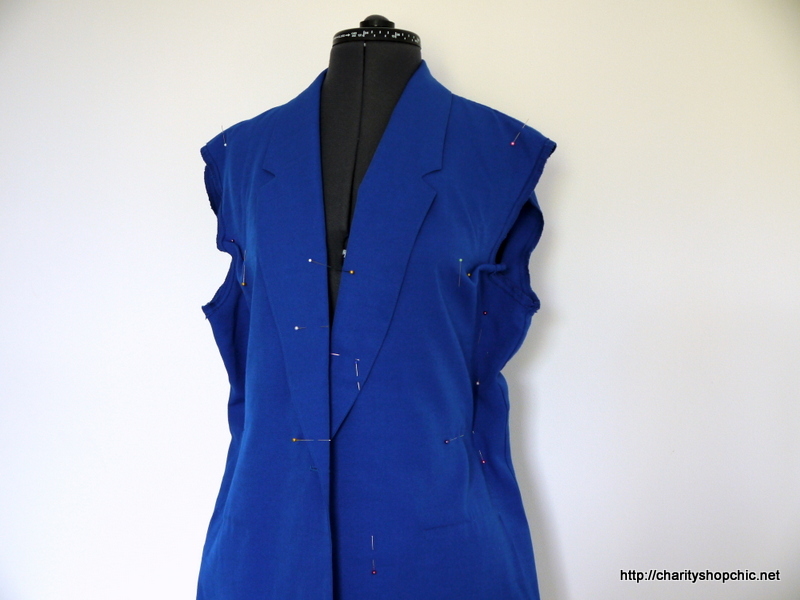 Check this blog out, she has such amazing seamstress skills. She creates so many beautiful things out of thrifted items. I am very envious of her talents and the results. Wow! Your refashions are super inspiring. Thanks, Donna! Glad you’re enjoying reading. Girl you have serious skills to go with your amazing vision! 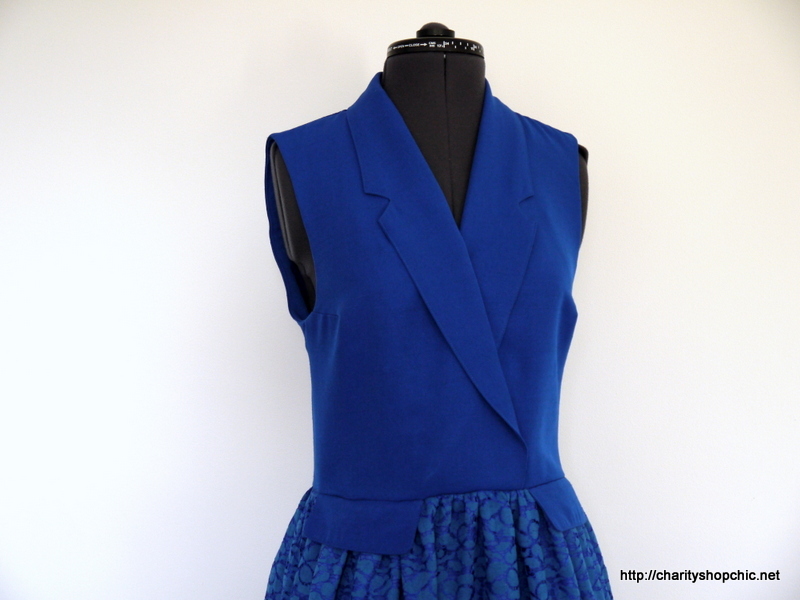 I mean really, to see this stunning dress in that sad blazer…you ROCK!!! And your nails and bag are awesome too!!!! Ha, thanks! I am loving this new nail colour – it’s like opaque white with a hint of pink. I love it! Such a brilliant refashion. really great!such a good idea and such a lovely result! Thanks, Martina! And thanks for commenting! Thank you – I am really pleased with it! Beautiful dress. This is one of my favourite refashions. Thanks so much, Camilla! It’s one of my favourites, too! Thanks, Eimear – I took a chance on the Ebay lace and it paid off, although it isn’t quite perfect, it’s passable. Wow, this looks great! 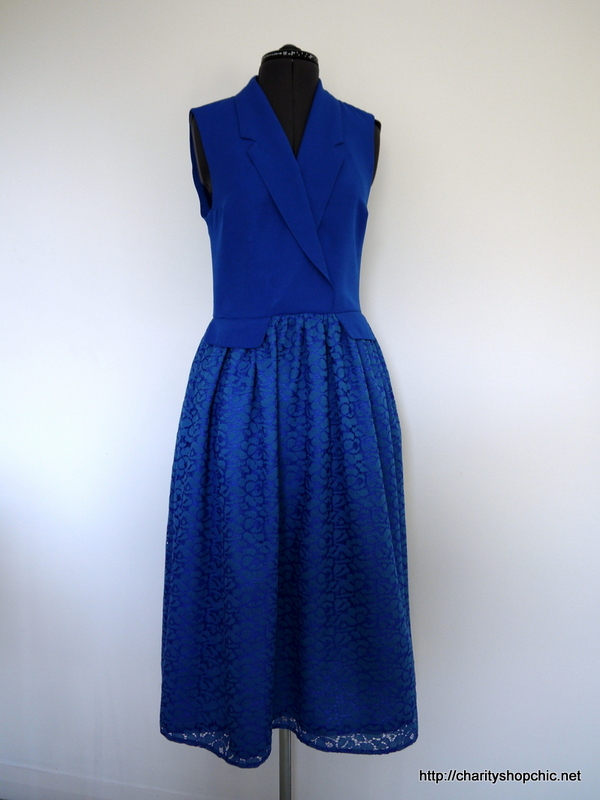 I love the shade of blue, and using Dior as your inspiration is genius! Hi Amelia, thanks for commenting. I love Dior and will certainly be paying them a visit when I win the lottery. Oh! That’s lovely! What a fab transformation! I am in awe of how you come up with the ideas. 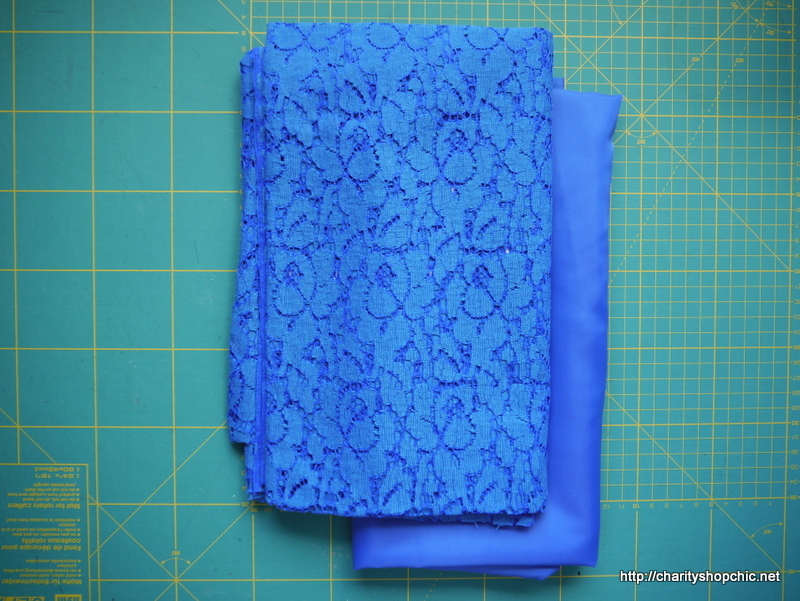 It’s a lovely shade of blue and the lace skirt just looks lovely. Popping in as part of my 300 blog comments in 30 days challenge. Hi Linda, I appreciate the comment. I’m keen on this shade of blue as an alternative to navy. Good luck with the challenge! You are a genius. What a beautiful transformation. Hi Nancy – thanks for the kind comment! This? This is so beautiful. As always, I am in awe of your skills. Aw, thanks! That means a lot. As always, your work is stunning. Congratulations. Wow! Love the dress, and that colour really suits you. Great colour match on the lace too. 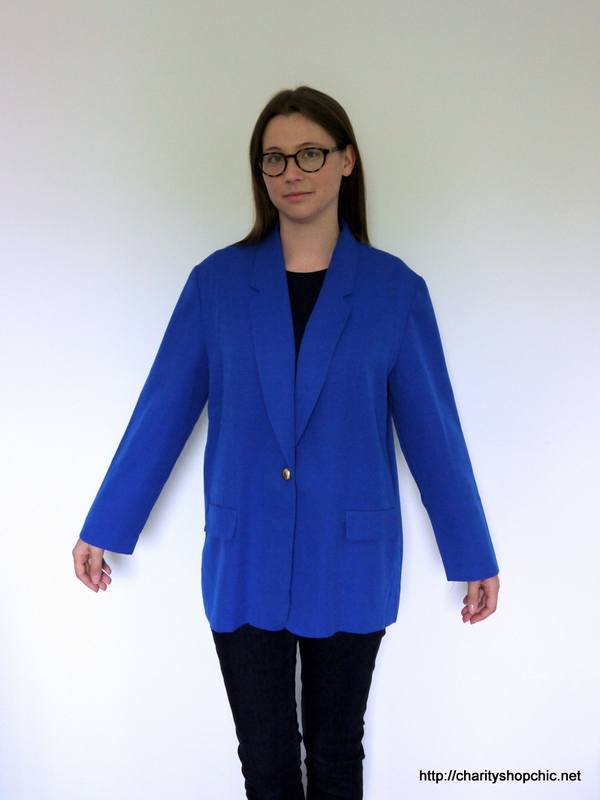 I’m trying to figure out why the original jacket looks so drab yet the colour is almost electric blue, must be the style. Great job! Anything that’s badly fitted can look drab, no matter what the colour. And also the lighting probably didn’t help in that picture! I love this refashion. 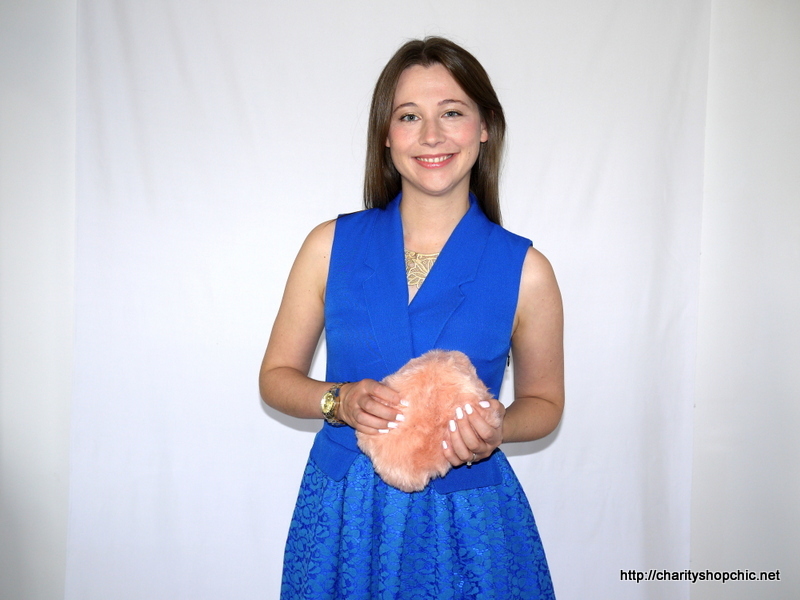 Just a great reminder that something simple (and a bit frumpy) can turn into something magical. Thanks for the reblog, Cassandra! Glad you liked this dress as much as I did. Gorgeous! 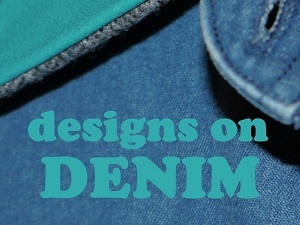 You have a great eye for interesting designs and such an amazing talent for recreating them! 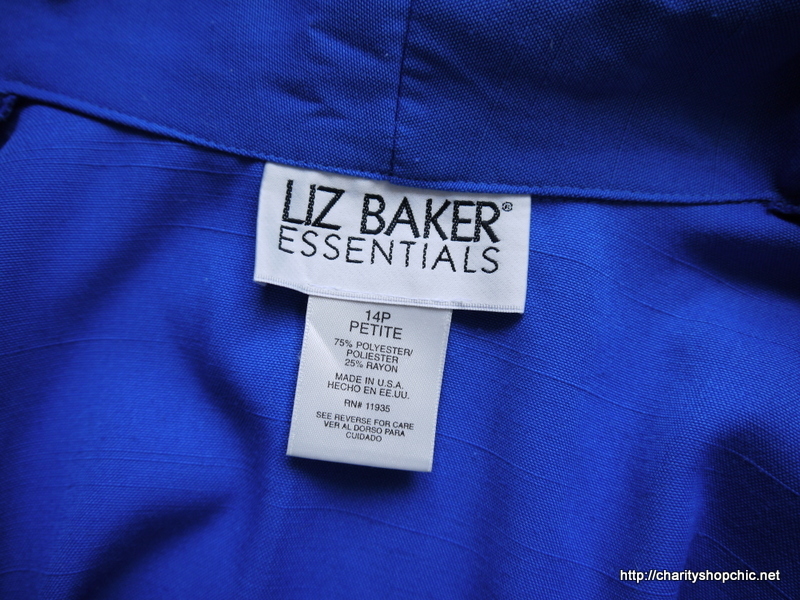 Haha, and I looked at the Dior dress and thought hmm… blazer! Thanks for reading. Amazing !!!! I love it ! Total success! Gorgeous dress. 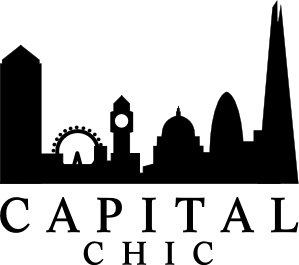 You can take on any couture creation!! Thanks for commenting Stephanie! Glad you liked it. Gorgeous!! 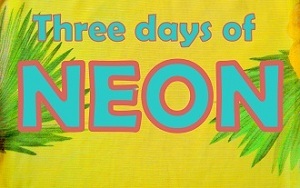 And my favourite colour, too. Mine too, Deb! Thanks for the comment. Thanks so much, Dayla – and thanks for reading! Thanks Claire, I had a lot of fun making and wearing it! Looks great – you are so talented! The color looks so great on you. I would make it shorter, as I like short, but in general it is super cool idea!